Shirazeh Houshiary’s 'String Quintet' is included in the 2017 'Sculpture in the Close Exhibition' at Jesus College in the University of Cambridge. 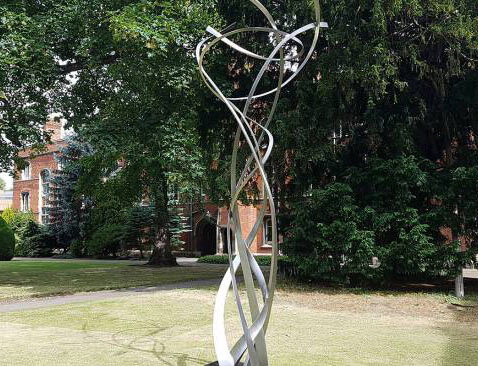 With an all-female line-up of exceptional artists, the exhibition marks the fifteenth outdoor sculpture exhibition in the grounds of the college. The annual sculpture exhibition was launched during Lord Renfrew's mastership. Jesus College is known throughout Cambridge, and indeed beyond, for these marvellous exhibitions of contemporary sculpture. This year's edition also includes work by Phyllida Barlow, Louise Bourgeois, Mona Hatoum, Kim Lim, Cornelia Parker, Agnes Thurnauer, Rachel Whiteread and Alison Wilding. The exhibition is on view through 17 September 2017. Read more here.